Planning a conference in Johannesburg and you need a conference venue? You have come to the right place!!! Conference Venues lists Johannesburg's top conference venues on one site. Whether you are looking for an intimate venue with conference facilities for just a few delegates or require a large conference centre with conference facilities to accommodate many delegates, Johannesburg Conferences will help you find the perfect conference venue. Johannesburg has a wealth of conference venues as well as many world class conference centres. Most of the top hotels in Johannesburg feature conference facilities for their guests; other venues for conferences in Johannesburg range from resorts to golfing estates and game reserves. The conference venues in Johannesburg are of a high standard and many international conferences are hosted regularly in Johannesburg. Johannesburg is a popular destination for conferences as it is the financial and economic hub of South Africa and produces over 15% of South Africa's gross domestic product and accounts for 40% of Gauteng's economic activity. 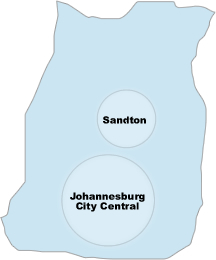 Johannesburg has a variety of manufacturing industries and many banking and commercial companies are located in the city. Africa's largest stock exchange, the JSE Securities Exchange, is located in Johannesburg.